Recently got tuned by Jeff Evans. -Skunk2 Pro 1 Cams degree-ed by Jeff for better idle. -Skunk2 valvetrain with flat headed valves. -SMSP 2.5" header | 2.5" Carsound cat | 60mm Apexi WS 2 exhaust. -Euro-R IM ported to match TB, and Hondata IM gasket (thanks to Shawn from Rosko Racing for dealing with my excessive nagging haha). -Professional Products ITR 65mm TB (should have gone bigger I guess). -Hondata S300 with a P28. -~2.5" SRI with a very worn out filter..
Idles pretty well and VTEC engagement is at approximately 6200. Thanks Jeff for putting up with me as well haha.. Very nice Jen. That's a great improvement. Car must be a lot more fun to drive now eh? nice numbers for the stuff you got done. not bad ... are you gonna go for more?? if so ...stage two cams ??? also taking the cat completely out should free up some ponies. i never got a chance to see under your hood.... i am assuming you have ps and ac right? do you know why he set vtec crossover to 6200??? i understand that would give a crazy burst of power but i thought from all the tuning that ive been witness to that 4600-4800 is usually the best place to set it to SMOOTH the hp curve. you can see it dips before it goes back up.... like i said not bad at all but i think you can squeeze alil more out of it. by the way your 4th gen is prolly the sickest one ive seen. Last edited by Bustr; 10-24-2008 at 08:48 PM. very nice jen! now when are you gonna bring your car out for us to see again? you tune by what the engine wants. Not what people on the internet think it should be at. but looking at the dyno sheet.... i think you can see where and what i am talking about. and its not what i think its what i know... i build cars... and i have seen the process of tuning a car... especially hondata.... i am stating it is odd that the vtec crossover is as high as it is..... and as far as the concern for not being able to rev higher seems like something could be going on ignition wise. just being logical. I know jeff knows the whole process of tuning just as I do. It doesnt matter what you consider to be right or wrong. If the engine doesnt want it, you are surely not going to put it at an unideal crossover. The pro series cams are a different breed than most street cams on the market. just trying to help. not saying anything is wrong... trying to discuss... and for my ownself to get a better understanding. not knocking evans... or you. just figuring that cams would pretty much make vtec stronger then it is and not die out after 800rpm. your thinking to much about vtec. The primary lobes (non-vtec) are pretty aggressive and dont share the "stock" mentality which allows them to make power much further on the low cam in comparison to a stock cam. 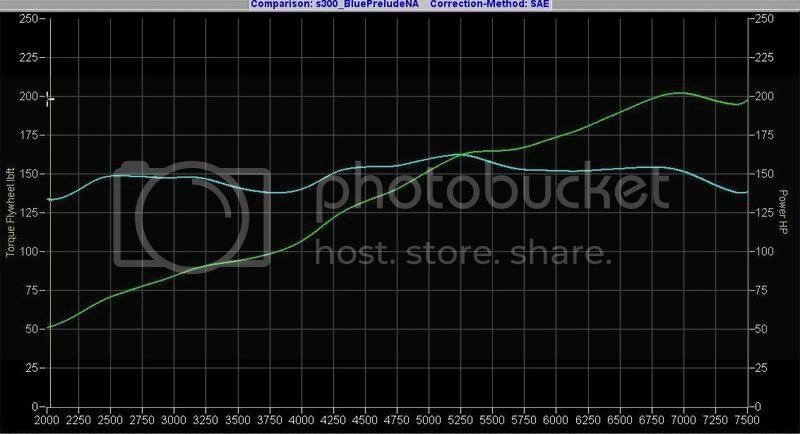 This is why you see such flat torque curves and these engines (when tuned properly) meeting MBT with them. when i first had my car tuned w/ boost... it was able to reach into about 7600rpm before falling out. recently when i had it retuned with a way smaller turbo (my old turbo the seals went) i noticed i also started to drop off around 6800... does any of you know why that is...or what factors could cause that... ?? i know h's are not exactly high reving motors compared to b series... but still i thought i would be able to go at least to 8k before breaking up. What size exhaust piping are you running? You said that may be what's holding you back. Just curious. ah sorry works been kickin my arse the last few weeks again eh..
i asked Jeff about the higher vtec setting at 6200, as since i am losing some top end after 7k. he said the pro series is different than the tuner series and mentioned that the primary lobes were more aggressive etc. of course im sure he tried many spots but overall he stated that my car idled like a champ and made the best and smoothest power there. - so i am running SMSP 2.5" header | 2.5" Carsound cat | 60mm(~2.36") Apexi WS 2 exhaust. - intake side i am at only 2.5" SRI | 67mm TB port matched to the Euro-R IM | stock everything else reaching motor. - cam gears were degreed at 0 intake, +4 exhaust. thats where the ended up being on skunk2's recommended centerlines anyway, so Jeff has told me. - A/f's were 12.8~13.2:1 during the pulls, which were the engine liked it the best, again as Jeff has told me. Maybe get bigger exhaust piping all the way through? If you really feel that's what's holding you back anyway... I know they say anything bigger than 2.5" is too big for an N/A build, but I've seen a lot of people that know their **** agree that H22 builds LOVE a 3" exhaust. Just an idear. Good luck! sorry man... I posted a reply a while ago and it seemed like it never posted. I'm not sure as to why it falls off *tipically. * But in your case i think it's your turbo. granted your engine was fully built correct? Jen I know it's torque!